We all want fresh, clean air. While I can’t get a country breeze in the heart of Brooklyn, I can find an excellent, minimalist air purifier. It’s not quite the same. But, it’s a good start. I’ve spent 6 months with my perfect minimalist air purifier – Dyson Pure Cool Link Air Purifier. Let’s review my experience and list a few alternative options that I didn’t select. My requirements for clean air aren’t complex and they aren’t optional. Finding the perfect minimalist air purifier is important. Everything must be space efficient, easily moved and aesthetically pleasing. It’s not possible to permanently install an air cleaning system in a rented apartment. Space in my one bedroom apartment is limited. And, there are a plethora of smells emanating from two humans and two cats. Not to mention, the bizarre cooking odors generated by my neighbors. As if that isn’t enough, New York City is known for its sticky black dust. I’m not sure why, but since it blows in through open windows, it must be in the air. I want my home to be a clean air sanctuary. An urban respite from my stuffy nose. I need an air purifier that can handle constant low quality air. Although my budget isn’t unlimited, I am willing to invest in a quality product that works. It also must meet my tastes, visually. I prefer a minimalist design aesthetic. It must look good and work well. The minimalist air purifier of my dreams must deal with dirt, dust, dander, smoke and pollutants. As I’ve aged, my allergies have grown more severe. An air purifier has gone from optional, in my 20s, to required, in my 30s. The air purifier is now furniture, on permanent display in my apartment. Let’s be honest, the Dyson air purifier looks the best from a minimalist aesthetic with the Alen a close second. Both Alen and Dyson would fit in with any minimalist home decor. Dyson has excellent design. Clean lines and a simple interface are their hallmarks. The Dyson design team does a great job on appearance. For the Dyson, the bladeless fan design is elegant, efficient and unexpected. Dyson isn’t restrained by conventions. The same can be said of Alen. In the past, minimalist designs were difficult to find, limited to the super wealthy who can commission work. Today, we can have great, minimalist decor with a reasonable budget. Take a look at Dyson’s marketing video. They hit all the best points on their Pure Cool model. Immediately, I identified the Dyson Purifier as my favorite. It has my preferred aesthetic, and it’s not black. It has excellent ratings. But, the price isn’t exactly a bargain. That said, it is cheaper than the Alen BreatheSmart Air Purifier. Also, the Dyson has a smaller footprint than the Alen BreatheSmart. I also love the air washing concept. The Venta AirWasher looks interesting. It’s unique. Digging into the details, air washing started to look less exciting. Ultimately, the air washer had a few drawbacks that made it less than optimal. A quick list of the some of those drawbacks. Including a humidifier seems positive, and it is in the dead of winter, but when summer rolls around, humidity is plentiful. In New York, summertime humidity can easily reach 100%. I struck the Venta from my list. In case you’re curious, a musician friend suggested the Venta AirWasher. If your home contains wooden instruments, then the Venta AirWasher may be a better choice. Or, if you’re building the first combination apartment, live-in humidor, the Venta may be ideal. After I had eliminated the Venta. I was left with variations of the same concept: a traditional filter air purifier. 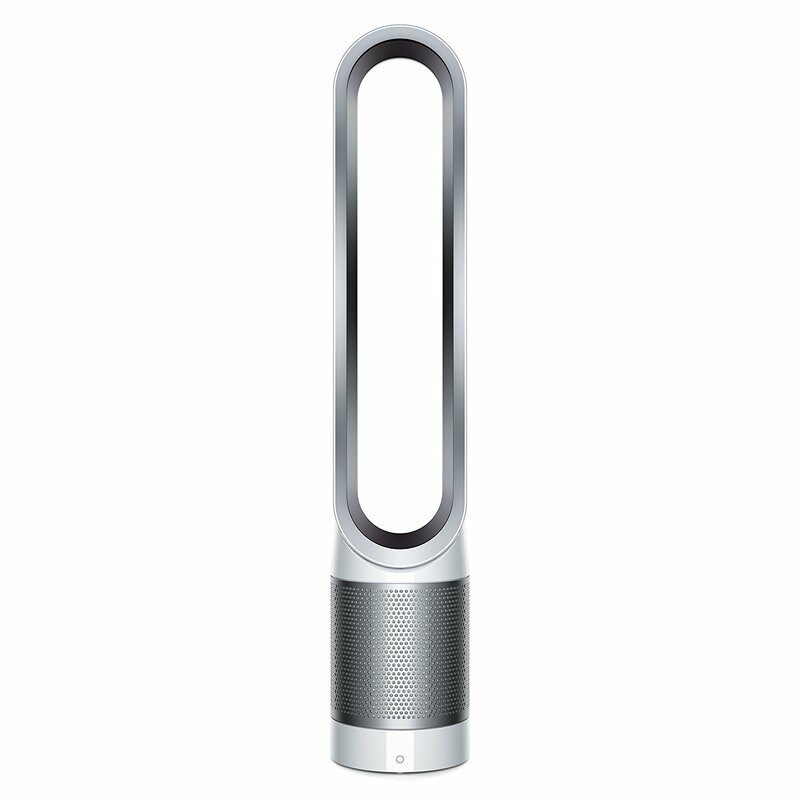 I’m most excited about Dyson Pure Cool Link Air Purifier. The Link portion is interesting. Being able to connect to the Air Purifier from my iPhone, aka the Link, is cool. I can’t say I’m totally on board with the IoT trends. I’m not sure everything in my home needs to be connected to the Internet. I am, however, very interested in knowing how the air in my apartment compares with the outside air. That is something the Dyson Link app does report. Just to be clear, there is a passive filter life expectancy system in the app. The app reports on the number of available hours left for a filter. It’s okay, but I think an iOS notification from the app or an email would be more effective. I was left trying to interpret the symbols on the small LCD screen before thinking to check the app when it came time to replace my filter. It’s an area where Dyson can improve. Thankfully, software is easy to update. As for the cost of the filters, my allergy medication for 6 months costs more than the filter, which last about 6 months. And, with better indoor air quality, I’ve been able to ditch the allergy medication completely! That’s a win in my book. Not to mention, a welcome trade off. I purchased the Dyson Pure Cool Link Air Purifier in July 2016. I replaced my first filter last week after running the air purifier continually since the day I bought it, 6 months ago. I love it! The air is noticeably fresher. I placed the Dyson Air Purifier next to my bed, in the bedroom. And, it’s easily able to clean the entire apartment. Even cooking smells are removed within an hour. We often cook steak and the house can become quite smoky. My Dyson Pure Cool Link Air Purifier has easily managed every pollutant thrown at it. I couldn’t be more happy with it. I’ll update this post again in a year to talk about long term reliability. Currently, long term reliability is excellent. One of the unexpected benefits of the Dyson air purifier is that I have to dust and sweep less often. Not only is the air inside the apartment cleaner, but also the floors are cleaner. The apartment is cleaner. There is less dust in my apartment. The Dyson air purifier is ideal for the busy urban dweller. I only wish I could travel with my Dyson Pure Cool Link Air Purifier. It’s got a small footprint, but just not small enough to fit in my carry-on luggage. You can purchase the Dyson Pure Cool Link Air Purifier on Amazon Thank you to machines that clean urban air and make city living more pleasant. The @AskDyson Twitter account responded to this review. @urbanminimalnyc Thanks for sharing! And good news - a push notification for filter replacement can be switched on in the Settings menu. Sadly, I already have their notification enabled. It was enabled by default. However, I still wasn’t notified when my filter hours depleted. Looks like Dyson just may have a bug in their software. Hopefully, they are able to resolve that soon.